We just had a small earthquake in northern California. Here is the USGS website for the M = 3.4 earthquake. If you felt it, please go to the USGS “Did You Feel It?” website to fill out a report! 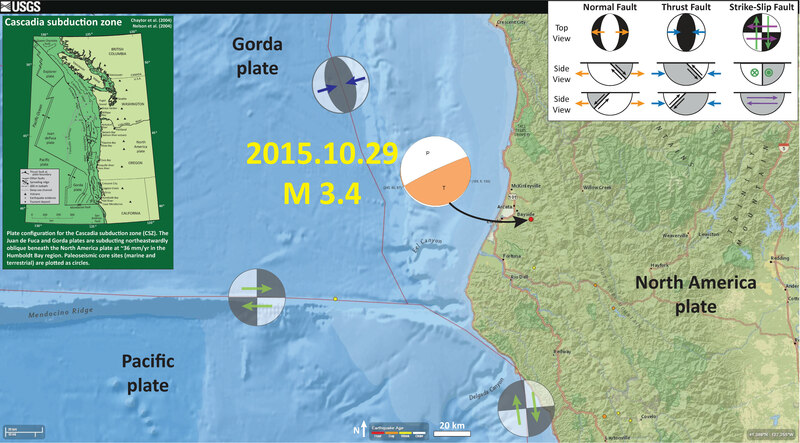 This small earthquake is due to deformation in the downgoing Gorda plate. 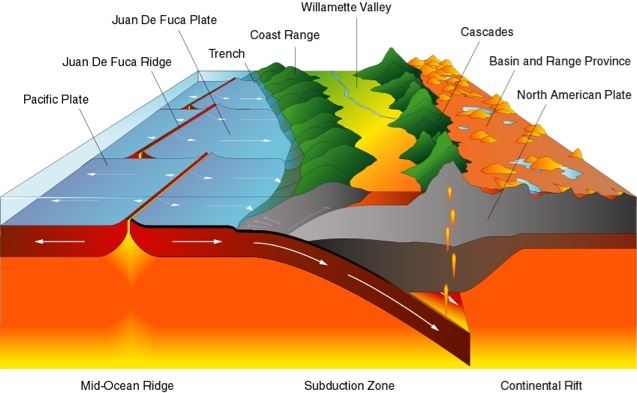 The lower plate (which is the Juan de Fuca plate in your part of the world) deforms in various ways as it descends. 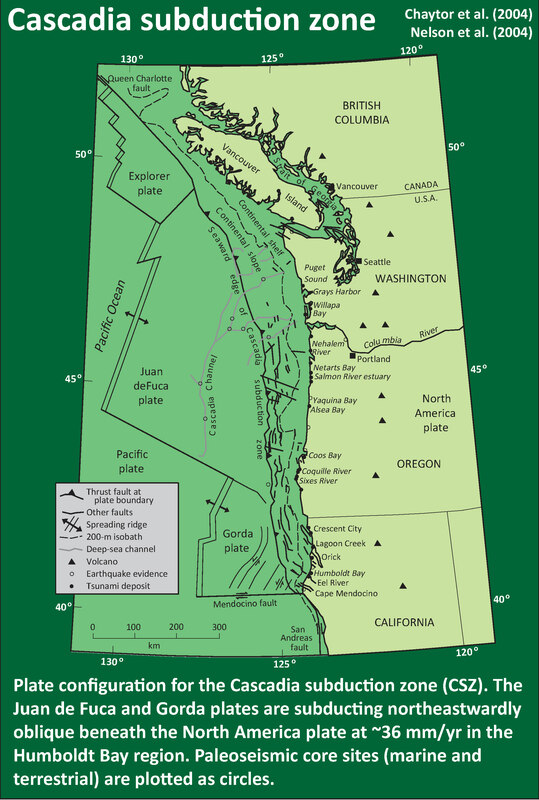 Today’s M 3.4 does nothing to affect the likelihood of a larger Cascadia subduction zone earthquake. It is simply interesting to those of us who felt it…. Here is a map showing the epicenter as a small red dot. I placed one of the focal mechanisms on the map. 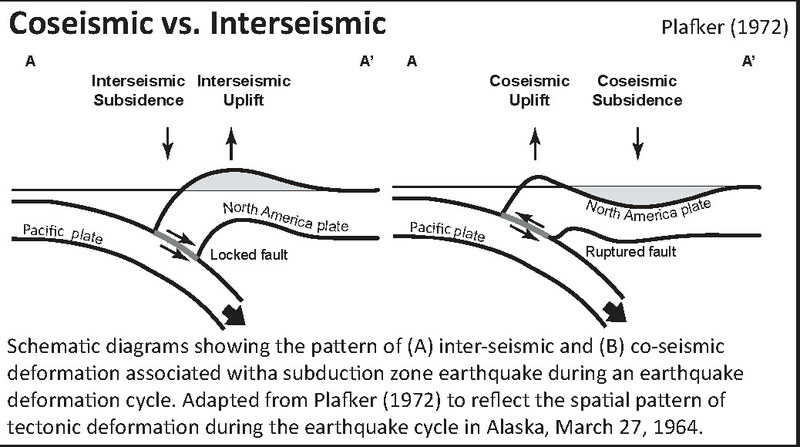 The earthquake strikes east-northeast, oblique to most of the other seismicity. 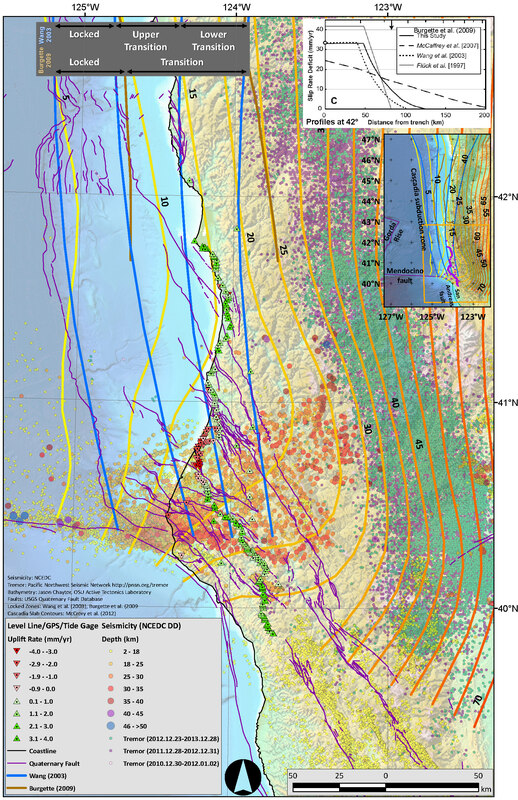 The hypocentral depth plots deeper than the subduction zone fault (which is about 15-20 km in this region), so this earthquake is probably in the Gorda plate. Jacob Crummey (USGS) and Steve Tillinghast (HSU) had just completed installation of a new broadband seismometer in Founders Hall. We got the 3 component waveform and it looks great! Top is vertical, middle is horizontal north and bottom is horizontal east. 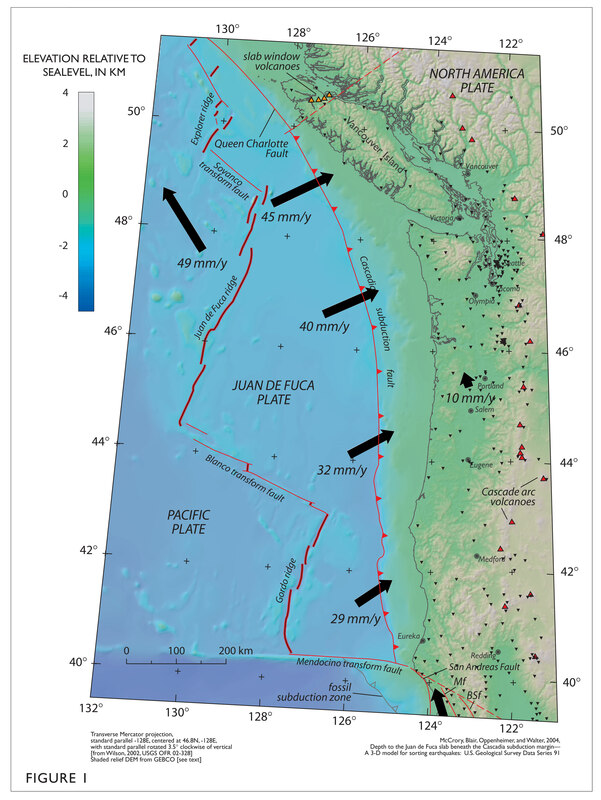 The larger earthquakes plotted in the map below probably do more to load strain along the Cascadia subduction zone fault (than the M 3.4). The map below shows some of these larger magnitude earthquakes. Here is a post about this earthquake from May 2015. This shows how broadly this M = 3.4 earthquake was felt. 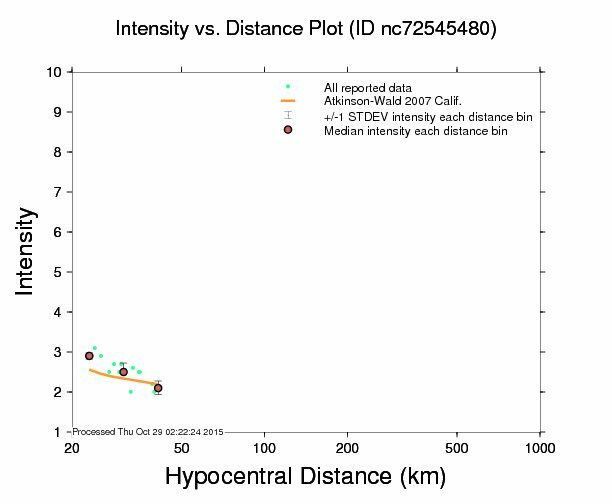 This is a plot showing how the ground motions attenuate (lessen) with distance from the earthquake. The orange line is an estimate of the intensity of ground motions based on a numerical model. This numerical model is based on a regression of hundreds of earthquakes (distance vs. magnitude/intensity). These regressions form the basis for Ground Motion Prediction Equations (GMPEs). The blue dots are the actual observations made by real people (using the DYFI form that I posted above). 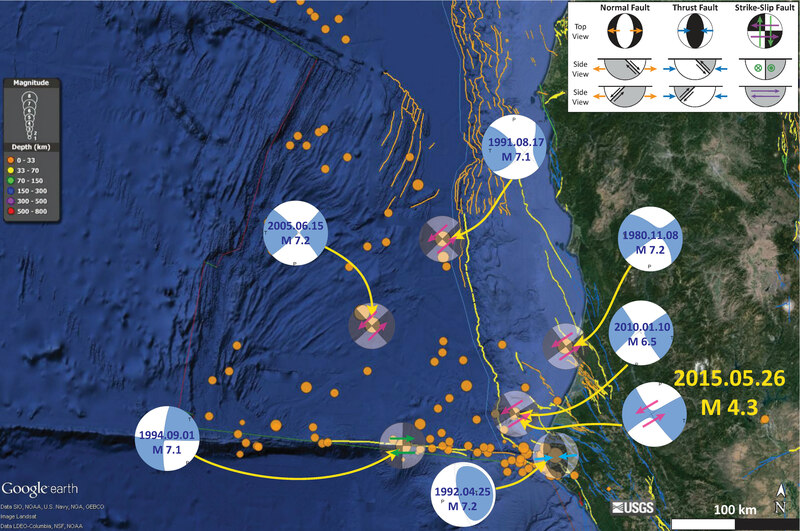 These model based estimates of ground shaking intensity are used, especially for larger earthquakes, to determine what damage might be expected. See my post about the recent post about the M 7.5 earthquake in Afghanistan, where I show a PAGER report adjacent to the DYFI map. The PAGER report is the report that lists the probable extent of damage to people and their belongings. Aid organizations and governments can estimate what scope disaster efforts might need to be based upon these PAGER reports (note the USAID logo). 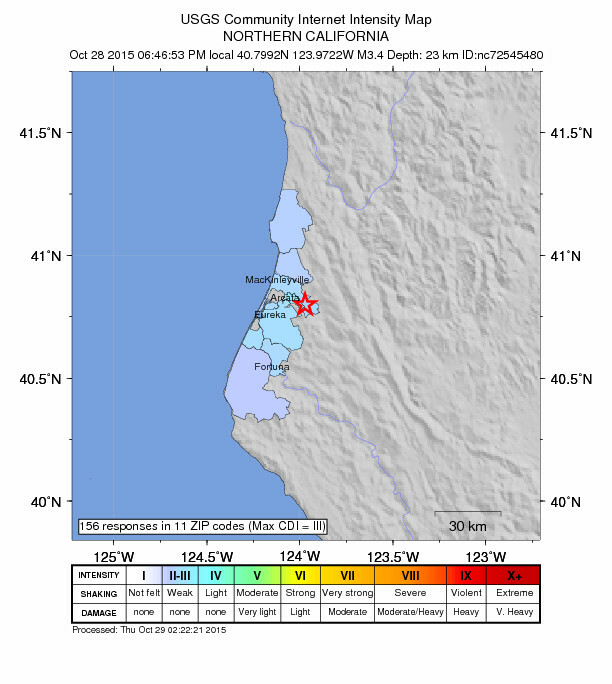 3 Responses to Earthquake in Bayside (northern California)! Sitting in Grief group tonight talking about the instability of form. I was driving. Axis perpendicular to the regional trend. Nearly perfect normal faulting, relatively deep (in the descending slab?) this is an odd bird. looks more compressional… but i removed the arrows plotted above the focal mechanism… too bad that there is no moment tensor. we would have a better idea.